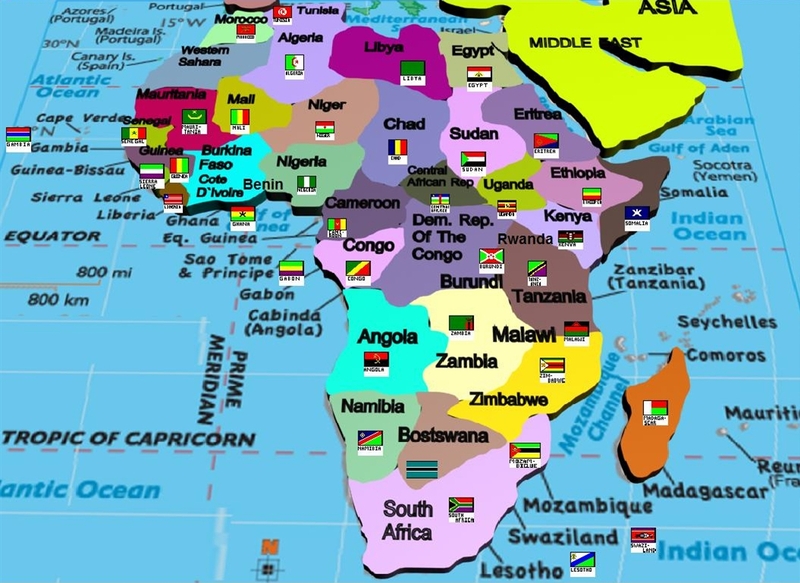 Africa the planet's 2nd largest continent and the second most-populous continent (after Asia) includes (53) individual countries, as well as Western Sahara, a member state of the African Union whose statehood is disputed by Morocco. With just over a billion people (a 2009 estimate) it accounts for just over 14% of the world's human population. It also contains the Nile River system, the world's longest, and the massive Sahara Desert, the world's largest. Africa is surrounded by the Mediterranean Sea to the north, both the Suez Canal and the Red Sea along the Sinai Peninsula to the northeast, the Indian Ocean to the southeast, and the Atlantic Ocean to the west. The continent straddles the equator and encompasses numerous climate areas, and is the only continent to stretch from the northern temperate to southern temperate zones. Africa, particularly central eastern Africa, is widely thought (by science) to be the origin of humans as evidenced by the discovery of the earliest hominids and their ancestors. 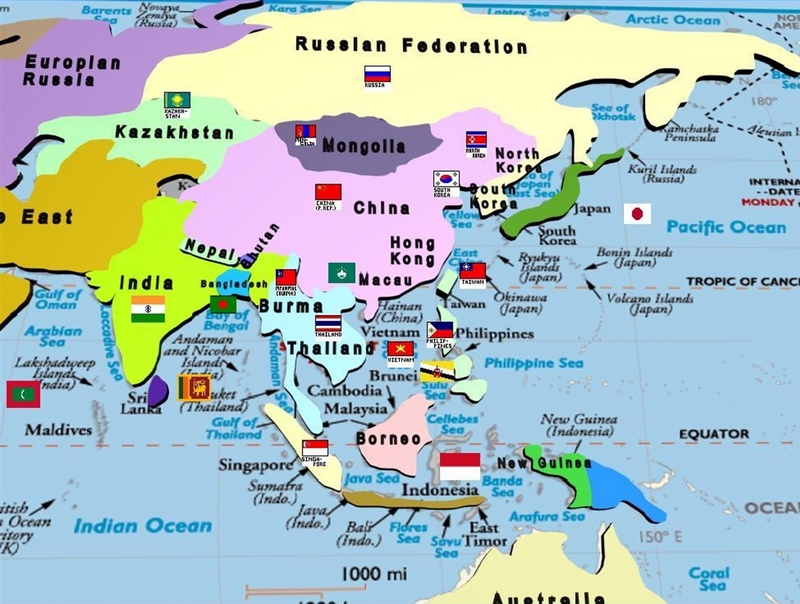 Asia:- has three important recognized political divisions: The Middle East, (or West Asia) countries are colored a lighter shade of gray; Southeast Asia (or South Asia) countries are colored a medium shade of gray, and North Asia countries are colored a darker shade of gray. Note that European Russia is also considered a part of the Asian Continent. 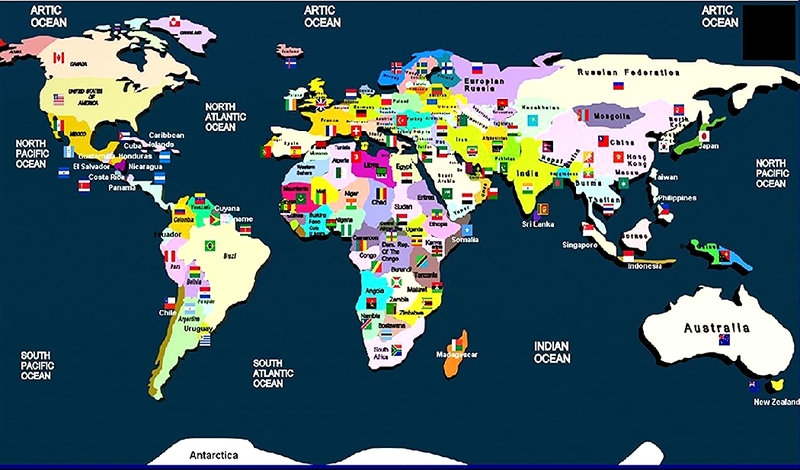 As the planet's largest continent, Asia covers about 30 percent of the world's landmass and includes (44) countries and assorted islands and/or dependencies. Significant features of the continent of Asia include the world's tallest mountain, Mt Everest in Nepal (and China), rising to 29,035 ft (8,850m). It also includes the world's lowest point, found in the Dead Sea, Israel/Jordan, at 1,286 ft (392m) below sea level. 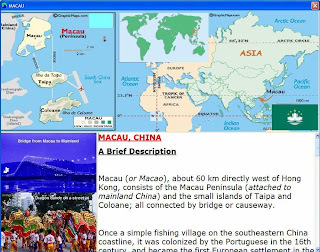 In addition, the continent includes the world's most populated countries, China and India; the world's longest coastline, the world's deepest lake; Lake Baykal, and some of the most important rivers on the planet. 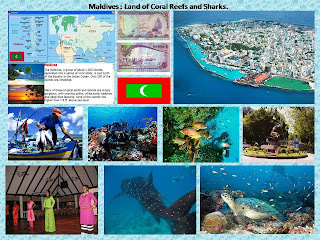 Maldives : Land of Coral Reefs and Sharks. Kazakhstan: Birth Place of Apples : Country of Natural Beauty and Minerals. 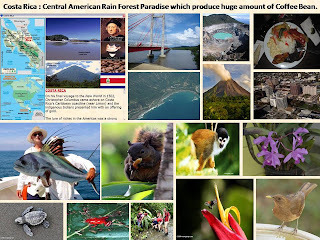 Costa Rica : Central American Rain Forest Paradise which produce huge amount of Coffee Bean. 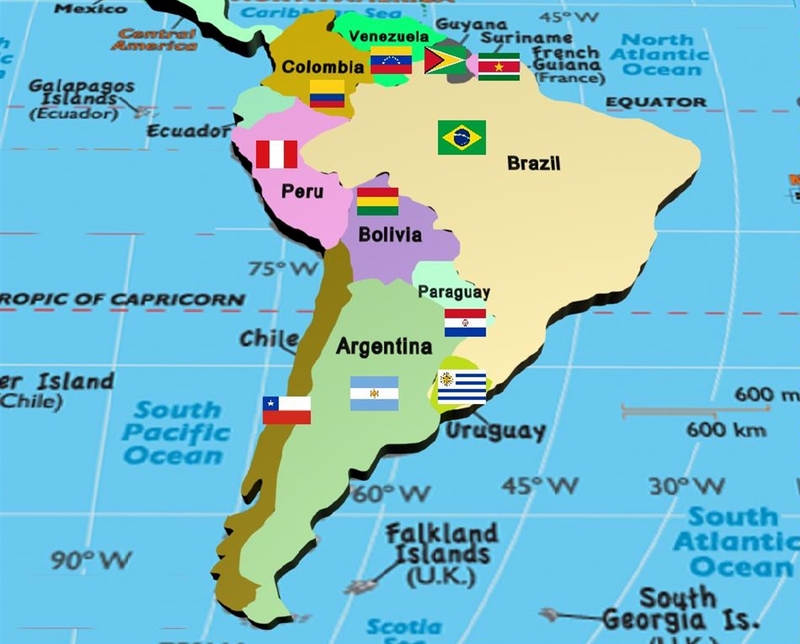 South America:- the planet's 4th largest continent, includes (12) independent countries and (3) major territories; the Falkland Islands, Galapagos Islands and French Guiana. The continent contains the world's highest waterfall, Angel Falls in Venezuela; the largest river (by volume), the Amazon River; the longest mountain range, the Andes, and the driest place on earth, the Atacama Desert in Chile. In addition, it includes the largest rainforest, the Amazon Rainforest; the highest capital city, La Paz, Bolivia; the highest commercially navigable lake in the world, Lake Titicaca; and, excluding research stations in Antarctica, the world's southernmost permanently inhabited community, Puerto Toro, Chile. 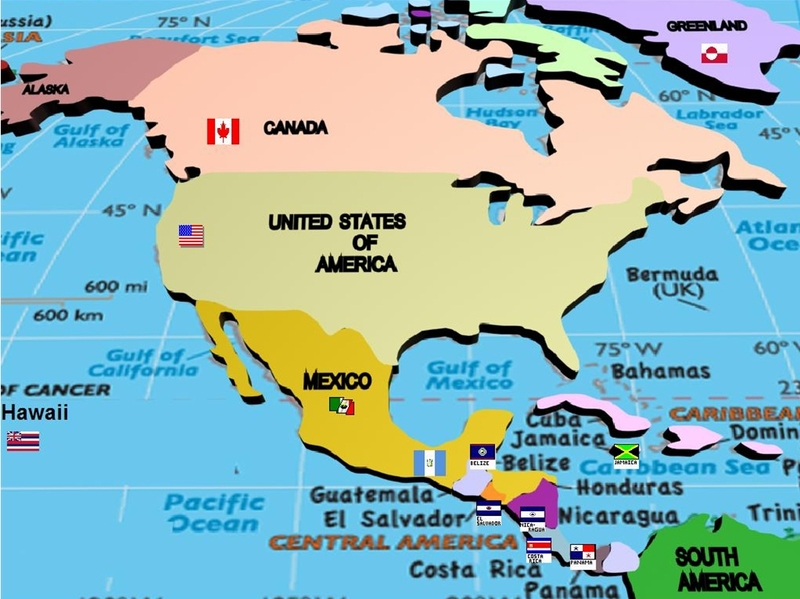 In north continent have Caribbean sea, in south have Antarctica, in east Atlantic Ocean and in west Pacific Ocean. 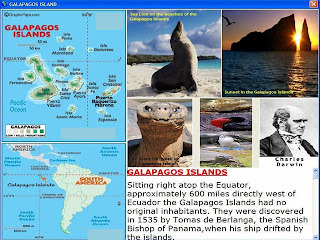 GALAPAGOS ISLANDS : Birthplace of Evolution Theory By Sir Charles Darwin. Europe have Africa continent in south, At east it attached with north-west part of Asia and middle east, at west Atlantic ocean. Europe have some part of Russia and Asia, therefore this continent can be called Erussia.This continent economically very rich after America. It have mountain range called Alps,Volcano named Mount Visuvias. River Thames in U.K. Northern Part of this continent have Norway, Sweden and Finland. 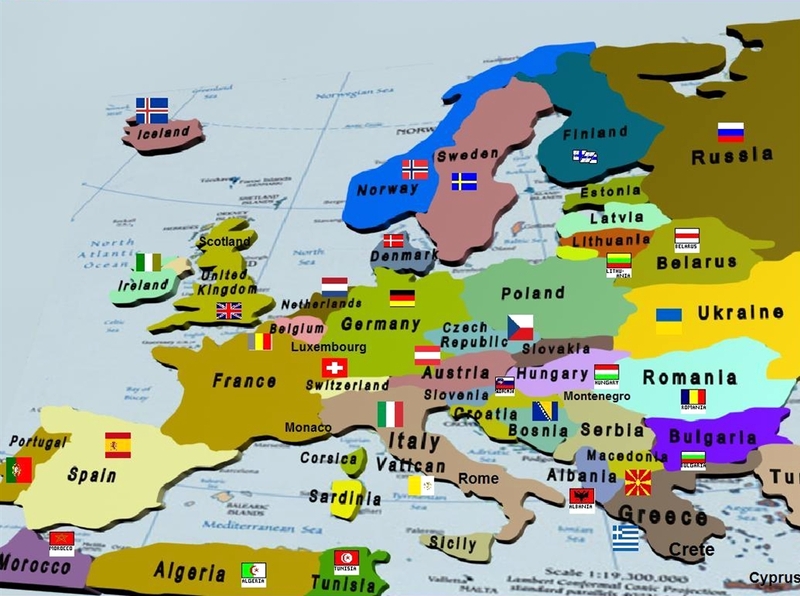 In North west part have United Kingdom and Ireland,in south have Italy,Greece. In middle Spain,France, Germany, Poland. In the east part it have some part of Russia and Romania. 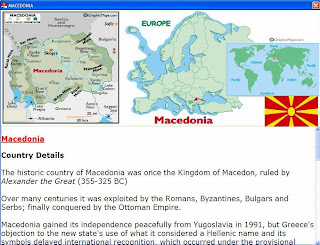 Macedonia : Alexander The Great`s own Country. 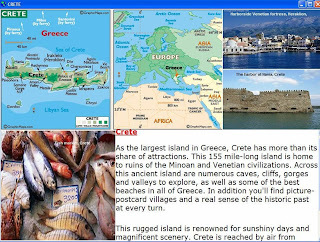 Crete : Was Lost Atlantis in Crete and Dwarka ? The Middle East (or West Asia) sits where Africa, Asia and Europe meet. The countries of the Middle East are all part of Asia, but for clarity reasons we geographically show them here as a separate landmass. Opinions vary as to what countries make up the modern definition of the Middle East. Historically, Armenia and Azerbaijan have been long associated with the Middle East, but in recent years, some sources now consider them to be more closely aligned with Europe based on their modern economic and political trends. We have moved in that direction, and the same applies for the island country of Cyprus, as it does for Georgia, the former Russian republic. The African country of Egypt is still thought (by some) to be in the Middle East, as well as the northern African countries that border the Mediterranean Sea. 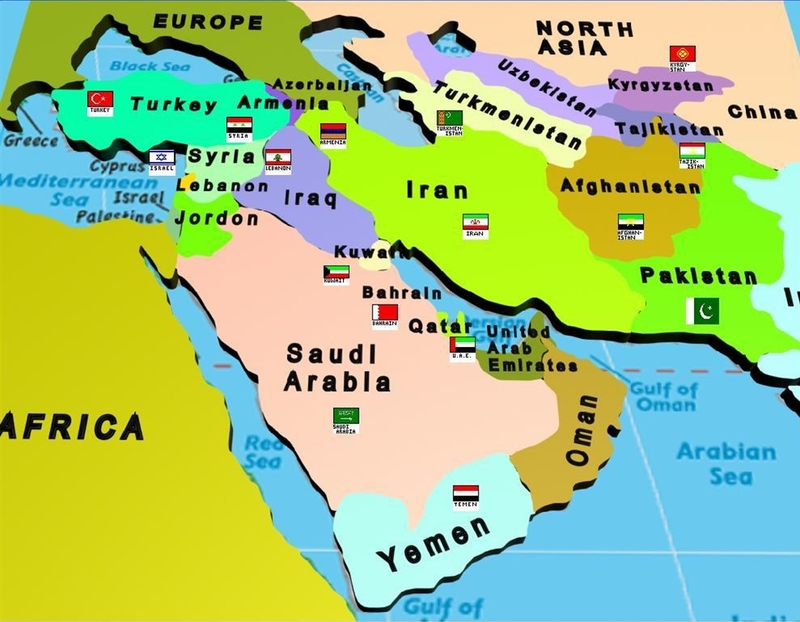 Here we attempt to show the modern definition of the Middle East, but in world of geography, there are often many answers or (personal or political opinions) to what appears to be a simple question. 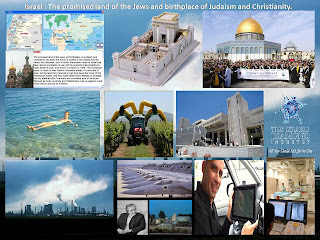 Israel : The promised land of the Jews and birthplace of Judaism and Christianity. 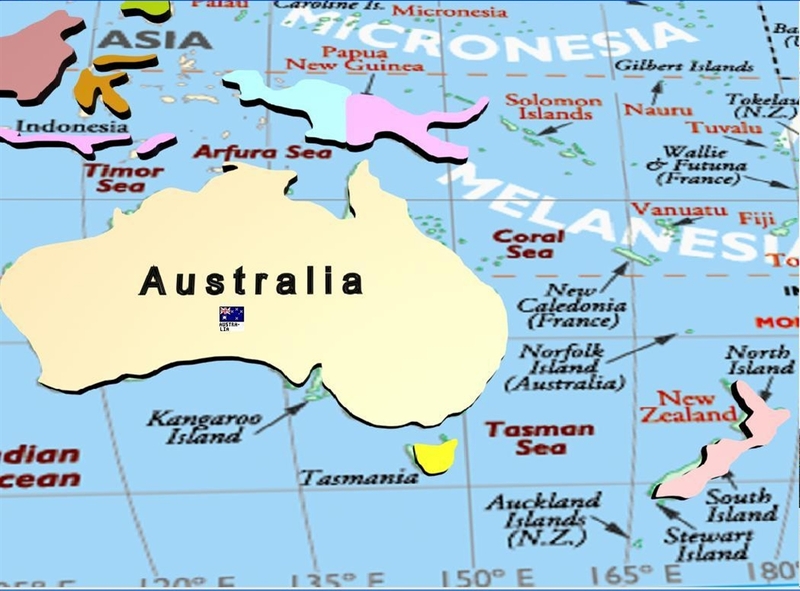 The first European exposure to Australia occurred in 1606, when the Dutch explorer, Willem Janszoon, sighted, then landed on the Cape York Peninsula. He found the area inhospitable and moved on. Regardless, adventurers and traders, aggressively searching for riches in the southern hemisphere, continued to sail through the northern coastal areas bordering a land the Dutch named New Holland. In 1688, on one of his three circumnavigations of the globe, William Dampier became the first British explorer to set foot on Australian land, coming ashore in Shark Bay. In the mid 18th century, Britain had an overcrowded prison population, and they required a new penal colony. In 1770, the legendary British explorer, James Cook, arrived in Australia and found the eastern coastline a most desirable location. He subsequently named this land New South Wales, and claimed it for Great Britain. Eighteen years later (one of the world's greatest sea voyages), a grueling 252 day, 15,000 mile journey brought eleven ships carrying about 1400 people (mostly convicts) from England all the way to Australia. They anchored at Port Jackson (Sydney Harbor) on January 26, 1788. There, under the command of Captain Arthur Phillip, in his capacity as the colony's first Governor, the British Crown Colony of New South Wales was established. 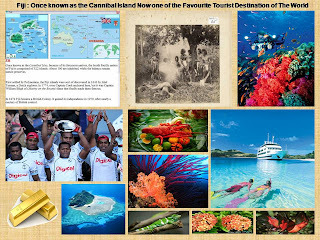 That day (Australia Day), is an official public holiday celebrated in all states and territories of Australia. For the next 80 years - in a somewhat provocative move - over 150,000 additional men and women (convicted criminals) were shipped to Australia, often enduring difficult and deplorable conditions during their lengthy ocean journeys. As a result, until the Australian Gold Rush of the 1850's brought thousands of (free) immigrants to Australia in search of riches, the settler population was dominated by convicts and their descendants. In this land of incredible opportunity (for some), the indigenous Aboriginal Australians and Torres Strait Islanders were suffering. 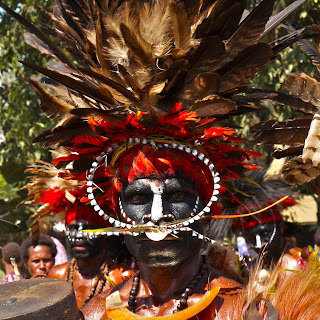 Their population base decreased dramatically in the 19th century as imported diseases killed thousands, and forced displacement and blatant land grabs disrupted their traditional lifestyles. During the 19th century, separate (somewhat independent) colonies were formed from parts of New South Wales, which loosely occupied the eastern half of the country; they included Queensland, Tasmania, South Australia and Victoria. 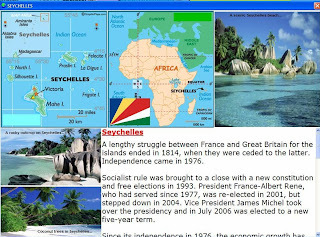 On January 1, 1901, a federation of colonies took shape after years of discussions and planning. The Commonwealth of Australia was created as a Dominion of the British Empire, and a new nation was born. Western Australia, granted self-government in 1889 by the British, was the most reluctant participant in this new Commonwealth of Australia, but joined nevertheless. Immediately thereafter, the Australian Capital Territory was formed from a part of New South Wales, in an effort to provide a location for the new federal capital of Canberra. The Northern Territory joined the Commonwealth that same year, and at that time, the population of Australia was nearly 4 million, which included approximately 95,000 indigenous peoples The founders of this new nation promoted their belief in civil, economic, political and social equality for all. Free education, trade unions, women's suffrage, maternity allowances, sick leave and old-age pensions were successfully introduced. On April 25 each year (ANZAC Day), Australia commemorates the anniversary of the landing of troops of the Australian and New Zealand Army Corps during World War I at Gallipoli, Turkey. That decision to fight alongside Britain partially decimated the male population of Australia, as over 60,000 of its bravest were killed and many thousands were severely wounded. During World War II, Australian forces played a significant role in the Allied victory in Europe, as well as in the South Pacific, where they engaged the Japanese in many difficult battles within remote areas of New Guinea. The Aussies stood tall, and helped win the war. World War II literally sparked the country's economy, as unparalleled growth swept across Australia. Workers were needed and countless thousands of migrants from Europe arrived to fill the positions. Many were the wide-eyed young, all hopeful for a bright and profitable future, and they would not be disappointed. In total, almost two million immigrants came to Australia between 1948 and 1975. Across the country major construction projects paid solid wages, and home ownership rose dramatically. In 1956, Melbourne, Australia hosted the Olympic Games and the world watched this new country shine. The 1960's were a transition period for Australia. At the forefront of change, the far-sighted citizens of Australia voted (overwhelmingly) for full citizenship and a (government-mandated) quality education for the estimated 350,000 Aboriginal and Torres Strait Islander peoples that lived in their country. And after some (short-sighted) immigration restrictions were finally lifted, Australia is today a beacon of democratic procedures and non-discriminatory policies. In September of 1999, Australia led the international peacekeeping force sent to restore order in East Timor. That same year, Australia's 11.6 million voters rejected a referendum that would have ended Australia's formal allegiance to the British Crown. Australia remains a constitutional monarchy with a parliamentary system of government. Britain's Queen Elizabeth II is the Queen of Australia. She is represented (symbolically) by the Governor-General at the federal level, and by the Governors at the state level. Although the Governor-General maintains certain powers, the leader of the political party with the majority of support in the House of Representative becomes the country's Prime Minister. Australia has an enviable, strong economy with a per capita GDP on par with the dominant European economies. Robust business and consumer confidence and high export prices for raw materials and agricultural products are fueling that economy, particularly in mining states. Australia's emphasis on reforms, low inflation, a housing market boom, and growing ties with China have been key factors behind the economy's 16 solid years of expansion. At the close of the 2000 Olympic Games in Sydney, the Australian rock group "Men at Work" sang their popular and patriotic signature song, "Down Under." One of the lyrics asks the question, "Do you come from a land down under?" Well, millions of travelers each year could easily answer, "No, but I've been to the land down under, and I loved it!" Of all the travel destinations on Planet Earth, Australia remains one of the most attractive choices. Surely it offers a wide variety of things to do, sites to see and family attractions of all description, but in this land of dazzling scenery and big blue skies, it's the charming, friendly faces that make all the difference. Antarctica covered with thick layers of ice , therefore no human can live in this continent, only Scientist and research group go and live some month for their study.Animal like Penguin, Seal, Skua are live in this continent. In North Atlantic Ocean is shituated, In south and west Pacific ocean is shituated and east Indian ocean is shituated. Pacific Ocean encompasses approximately one-third of the Earth's surface, having an area of 179.7 million square kilometres (69.4 million sq mi and 161 million cubic mi) —significantly larger than Earth's entire landmass, with room for another Africa to spare. Extending approximately 15,500 kilometres (9,600 mi) from the Bering Sea in the Arctic to the northern extent of the circumpolar Southern Ocean at 60° S (older definitions extend it to Antarctica's Ross Sea), the Pacific reaches its greatest east-west width at about 5°N latitude, where it stretches approximately 19,800 kilometres (12,300 mi) from Indonesia to the coast of Colombia and Peru – halfway across the world, and more than five times the diameter of the Moon. The lowest known point on earth—the Mariana Trench—lies 10,911 metres (35,797 ft) below sea level. Its average depth is 4028~4188metres (14,000 ft). 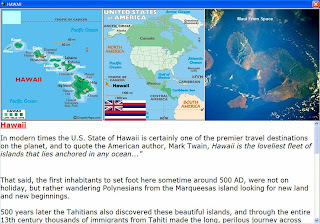 The Pacific contains about 25,000 islands (more than the total number in the rest of the world's oceans combined), the majority of which are found south of the equator. Including partially submerged islands, the figure is substantially higher. Atlantic Ocean is the second-largest of the world's Ocean divisions. With a total area of about 106,400,000 square kilometres (41,100,000 sq mi), it covers approximately twenty percent of the Earth surface and about twenty-six percent of in water surface area. 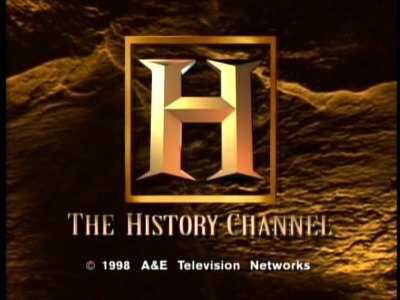 The first part of its name refers to Atlas of Greek Mythology making the Atlantic the "Sea of Atlas".The oldest known mention of "Atlantic" is in the histories of Herodotus around 450 BC (Hdt. 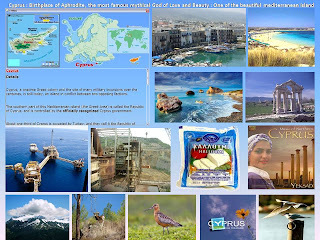 1.202.4): Atlantis thalassa (Greek: ; English: Sea of Atlas); see also:Atlas MountainThe term Ethiopic Ocean, derived from Ethiopia was applied to the southern Atlantic ocean as late as the mid-19th century. Before Europeans discovered other oceans, the term "ocean" itself was synonymous with the waters beyond the strait of Gibraltar that we now know as the Atlantic. The Greeks believed this ocean to be a Gigantic ocean that encircle the world. Atlantic ocean seen from western port of Portugal. Southern Ocean, also known as the Great Southern Ocean, the Antarctic Ocean and the South Polar Ocean, comprises the southernmost waters of the World Ocean, generally taken to be south of 60°S latitude and encircling Antarctica. It is usually regarded as the fourth-largest of the five principal oceanic divisions. This ocean zone is where cold, northward flowing waters from the Antarctic mix with warmer sub-Antarctic waters. Geographers disagree on the Southern Ocean's northern boundary or even its existence, with some considering the waters part of the South Pacific, South Atlantic, and Indian Oceans instead. Others regard the Antarctic Convergence, an ocean zone which fluctuates seasonally, as separating the Southern Ocean from other oceans, rather than the 60th parallel.The International Hydrographic Organization (IHO) has not yet ratified its 2000 definition of the ocean as being south of 60°S. Its latest published definition of oceans dates from 1953; this does not include the Southern Ocean. However, the more recent definition is used by the IHO and others. Indian Ocean is the third largest of the world's oceanic divisions, covering approximately 20% of the water on the Earth's surface.It is bounded on the north by the Indian subcontinent; on the west by East Africa; on the east by Indochina, the Sunda Islands, and Australia; and on the south by the Southern Ocean (or, depending on definition, by Antarctica). The only ocean is named after the geographic location called India. 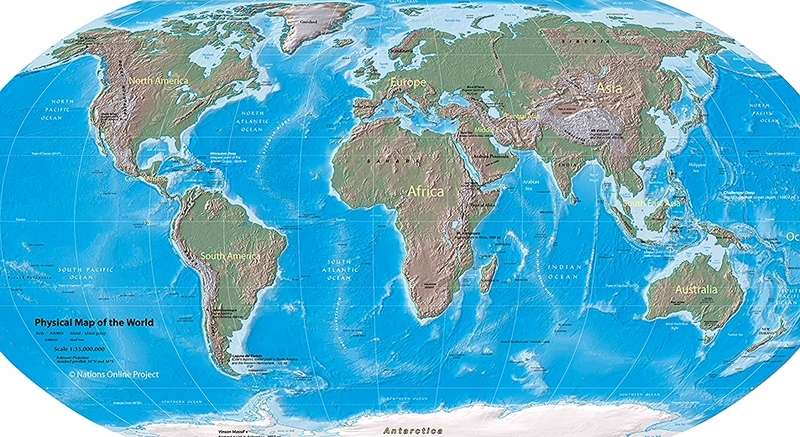 As one component of the interconnected global ocean, the Indian Ocean is delineated from the Atlantic Ocean by the 20° east meridian running south from Cape Agulhas, and from the Pacific by the meridian of 146°55' east. The northernmost extent of the Indian Ocean is approximately 30° north in the Persian Gulf. The Indian Ocean has asymmetric ocean circulation This ocean is nearly 10,000 kilometres (6,200 mi) wide at the southern tips of Africa and Australia; its area is 73,556,000 square kilometres (28,350,000 sq mi), including the Red Sea and the Persian Gulf. The ocean's volume is estimated to be 292,131,000 cubic kilometres (70,086,000 mi3).Small islands dot the continental rims. 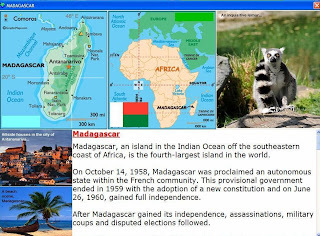 Island nations within the ocean are Madagascar, the world's fourth largest island; Reunion Island; Comoros; Seychelles; Maldives; Mauritius; and Sri Lanka. The archipelago of Indonesia borders the ocean on the east. Economically important silk road(red) and trade road(blue) alone Indian ocean.